Land Between the Lakes (LBL) is located Halfway between Nashville and Paducah KY. It sits between two of the biggest man-made lakes in the country. Formally Land Between the Rivers until the dams were replaced in the 60s as part of a flood control project by the Tennessee Valley Authority (TVA). Once the dams went in the Cumberland and Tennessee rivers in this section became Lake Barkley and Kentucky Lake. 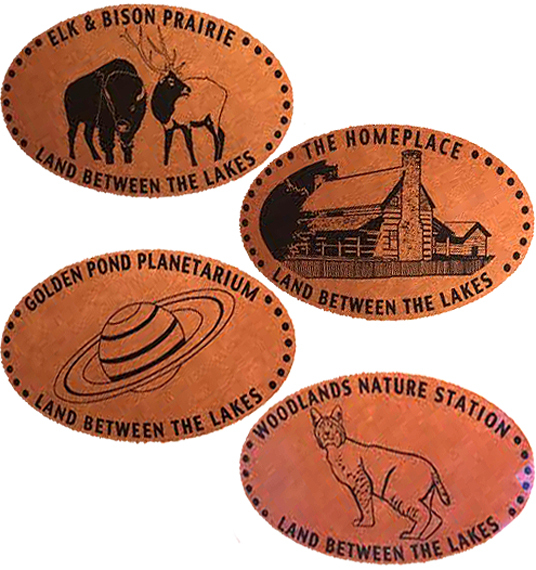 The park has Bison and Elk herds, a nature station, motorcycle trails, horse trails, planetarium, foundry sites, and an 1850 s old home. It starts in Paris TN and goes north along the "Trace" about 60 miles to Grand Rivers KY. The machine is located in the Golden Pond Visitor Ctr. & Planetarium Bldg, at the right of the entrance foyer. Take the Trace off of Rte 68/80 towards Dover, TN. The Planetarium is on the left approx. 100 yds. down the Trace. Pressing 4 high-quality images as of 2/20/16 imr.